Charles Jervas (otherwise Jarvis or Gervase) came from Ireland in about 1694 and studied painting under Sir Godfrey Kneller. Following a visit to Rome to learn drawing by copying antiques, he established himself in a house known as Bridgewater House in Cleveland Court, St James's. This house, which he gradually filled with an art collection, became a rendezvous for literary friends: Addison, Swift and Lady Mary Wortley Montagu. Alexander Pope stayed with him and for a while from 1713 studied painting in his studio. Jervas' first portrait of Pope was completed in 1714 and was subsequently engraved by Vertue in 1715. It was used as the frontispiece of Pope's first collected works in 1717. Until recently no portrait of Jervas was known, apart from an engraving on the cover of the posthumous catalogue for the sale of his art collection. However, a self portrait dated 1725 has come to light, having been in the possession of the Digby family during the 18th century. Jervas is recorded as having painted five portraits of members of this family, two of whom were friends of Pope. A detail from the portrait is illustrated here by courtesy of Philip Mould, Historical Portraits Ltd, 31 Dover Street, London, W15 4ND. 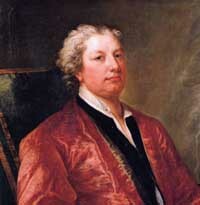 In 1723 Jervas succeeded Kneller as Portrait Painter to George I and in 1725 to George II. Kneller died that year, having a poor opinion of Jarvis's talent: "Ah! Mein Gott, if his horses draw no better than he does he will never get to his journey's end." Horace Walpole, too, thought little of his ability although he owned four portraits of Walpole ladies which were sold at the Great Sale: "In general his pictures are a light flimsy kind of fan painting, as large as life". He painted portraits of George II and Queen Caroline, as well as Swift, Arbuthnot, Newton and the Duchess of Queensberry, probably his best picture. He also copied the Raphael Cartoons at Hampton Court Palace. His version of Don Quixote (published 1742) was frequently reprinted. In 1727 he married Penelope Hume, a lady of considerable means. 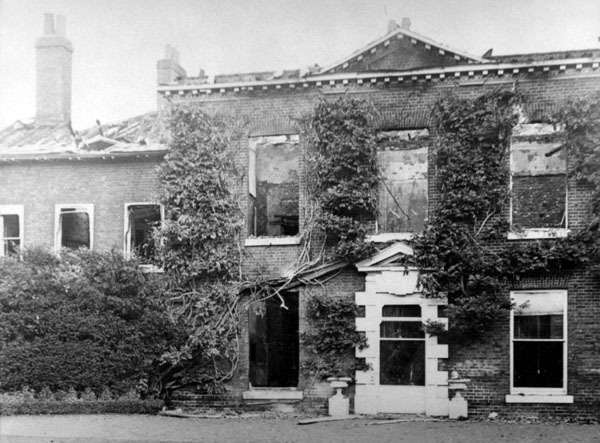 She had acquired Elm Lodge, a property in High Street, Hampton in 1726 otherwise known as The Elms and which was burnt down by Suffragettes in 1913. Pope noted, in a letter to Fortescue possibly of February 1731/2, that "Mr Jervas is come hither for his health, to Hamoton, & is to reside here some time every week." Jervas suffered from asthma and in September 1738 he visited Italy seeking some reprieve from the condition, returning in may 1739. He died in November that year and bequeathed £1000 to his friend, Pope, should he outlive his widow: this did not happen as she survived until 1747. The following spring his art collection was sold in 2265 lots in a sale lasting 9 days.